Shag, the LA-based artist with the swingin’, mid-century style, is releasing a new print that pays tribute to Spider-Man’s Silver Age roots — and his co-creator, Stan Lee. The limited-edition $599 silkscreen print — wonderfully named Life is a Great Big Bang Up after the lyrics from the 1967 cartoon — features Spidey rescuing a woman (Mary Jane?) from the clutches of six sinister villains — the Green Goblin, Doc Ock, the Vulture, Mysterio, the Sandman, and the Rhino. Now dig two cameos: Gwen Stacy on the lower left and Lee himself on the upper right. P.S. Thanks to buddy David Hyde for pointing this one out on Twitter. Go follow him! 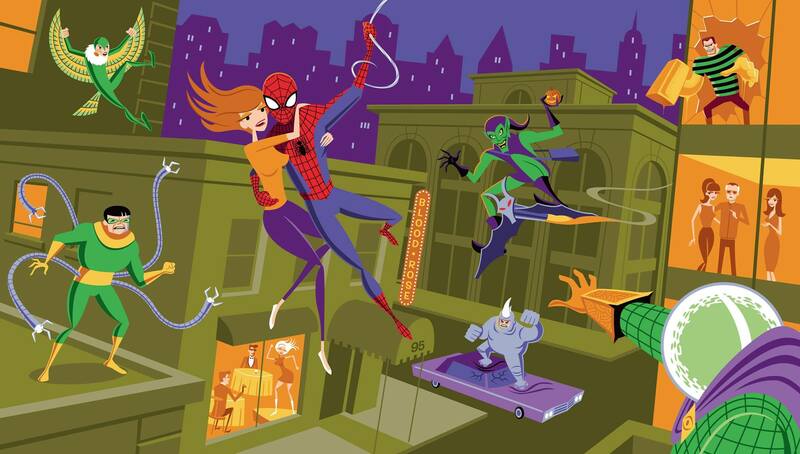 — 13 GREAT THINGS About the SPIDER-MAN 1967 Cartoon. Click here.